Wood burner flue out through wall? Posted: Thu Apr 28, 16 5:19 pm Post subject: Wood burner flue out through wall? I'm going to install a woodburner but rather than have the flue pass through the roof could I not have the flue go vertical and take a bend and pass out through the top of the wall and then another bend to straighten it up so the flue exits parallel to the wall. That way I don't have to pierce the roof and pay for a cowl and can still profit by all that heat coming off the flue pipe before it exits the room? That's exactly what ours does, so that we didn't have to run it through the bedroom and the expensive roof. If you put bends in don't use right angles but 45 degrees. Right angles act as a trap for soot & tar & restrict the smoke flow somewhat. iirc it will need a inner flue and outer pipe to protect the wall from thermal shocks (and to keep the flue gasses warm to get a good draft).a stove supplier should be able to advise and provide suitable parts. remember a rodding point to give access to the bends and riser just in case the rods are too stiff to make the turns from the burner end. AKA a double-wall or twin-wall flue I believe. The pipe work is not cheap, it's true. A cowl (do you mean flashing ?) costs approx the same, if not less, than an insulated flue 45' bend. You will need 2 bends, but only one flashing. 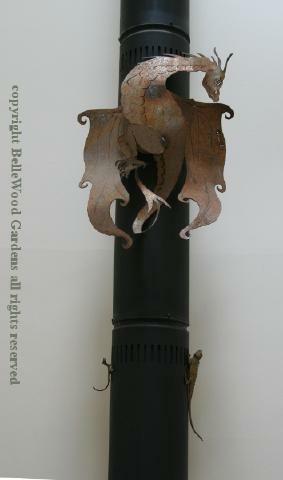 IIRC it is advisable to have the bends for a flue to pass through an external wall, as close to the burner as possible. 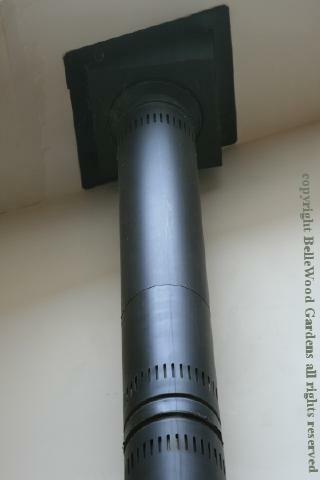 With the twin wall flue pipe,its insulated between both wall`s and doesn't omit heat to benefit it being inside. Flue Supplies.com I can also recommend for price and quality,pointed out to me by ?the lady from Montgomery with the white dog on avater. Our wood burning stove has a straight run of about 18 feet / 6 meters and then out the roof. It was installed in the (pre-existing) house the year after we moved here. The twin wall chimney pipe has an air gap between the two, with slits at the bottom of each outer section. This provides additional heated air for the upper story of our open plan house. Maybe twice a year in heavy rain when the wind is strong and from a certain direction do we get a little water leaking from above. Otherwise we appreciate that we are getting maximum heating from the wood we burn. And there is not that much creosote when the chimney is cleaned every year because we're careful to only burn well seasoned wood. Thanks for all the advice everyone. Much appreciated.